Much of Ethiopia’s history has been passed on through the generations by mouth. One consequence of this is that morals and lessons have been crystallized in the form of proverbs. We went ahead and picked our favorite Ethiopian proverbs. Some are wise, some are humorous, and some are a puzzle to figure out! This Ethiopian proverb is obviously our favorite as it is even on printed on our mugs and is the inspiration for our community-based work in Ethiopia! Regret, like a tail, comes at the end. A good conversation is better than a good bed. One should punish a child the first time he comes home with a stolen egg. Otherwise, the day he returns home with a stolen ox, it will be too late. Confiding a secret to an unworthy person is like carrying a grain in a bag with a hole in it. Coffee and love taste best when hot. 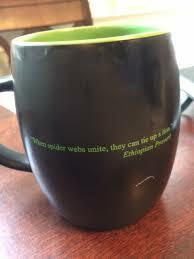 What is your favorite Ethiopian proverb? The BBC News in Africa has a great list of African proverbs on their site. Check them out and be inspired! Previous Previous post: The Duna Sadicho School in Ethiopia is Funded!